This essay was published in partnership with The New York Review of Books. A shorter version appears on the NYRBlog. The awarding of the 2012 Nobel Prize in Literature to the Chinese novelist Mo Yan has given rise to energetic debate, both within China’s borders and beyond. Earlier this month, ChinaFile ran an essay by Chinese literature scholar Charles Laughlin called “What Mo Yan’s Detractors Get Wrong.” That essay was, in large part, a critical response to an earlier piece in The New York Review of Books by Perry Link. We invited Link to respond. In my view, Laughlin’s essay raises two important questions: 1) To what extent, if any, are Mo Yan and other contemporary Chinese writers trapped in a Maoist language that constricts their expression, and perhaps their vision as well? and 2) Can writers who live under political censorship nevertheless find ways to write to write well? How Pervasive Is the Maoist Language Trap? 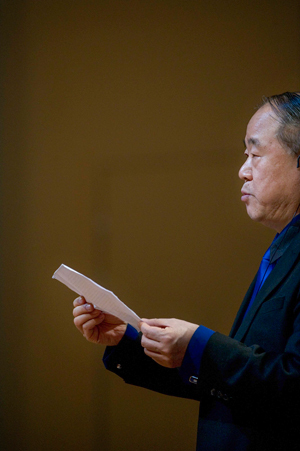 Nobel laureate Mo Yan during a public reading of his works in Stockholm earlier this month. But how much do unnoticed linguistic habits reflect conceptual approaches to the world—or even, as Sun suggests, shape them? Sun quotes George Orwell that “if thought corrupts language, language can also corrupt thought.” This is from Orwell’s “Politics and the English Language,” published in 1946, just a few years after the famous “Whorf hypothesis” advanced the notion that different languages lead to different world-views. Among Western cognitive scientists, Whorf has always been controversial. Hence it is interesting that Chinese communists (although there is no evidence that they borrowed anything from Whorf) have always had faith in the same principle. Since the 1950s, the Party’s Propaganda Department has disseminated lists of words for the media “to stress” and “to downplay” as political needs come and go,1 and the unchanging assumption has been that this word-engineering helps to “guide thought.” There is much evidence that it works, too. I was recently talking with a Chinese-language teacher whom I had not seen since 1989 in Beijing. Trying to recall our first meeting, she asked me, “Was that before or after the dongluan [turmoil]?” Teasing her, I asked, “What do you mean by dongluan? Student dongluan or government dongluan?” She replied reflexively: “Student dongluan, of course.” Then she peered at me for a moment, realized what I had meant, and said: “Oh, yes! Government dongluan. The massacre!” Then she went into a long apology to me: she herself had been a student protestor in 1989, had been in Tiananmen Square in the days before the massacre (but not during it); she was on the students’ side; she agreed with me. And yet the phrase “student turmoil” now rolled off her tongue as easily as “Wednesday.” How much conceptual baggage went along with it? How much does this kind of induced linguistic habit reinforce state power? And how much does this sort of thing affect Chinese writers? Laughlin and Sun raise a crucial issue. Can Writers Living Under Political Censorship Find Ways to Write Well? I have written elsewhere of what I call the “reverse magnet syndrome” in post-Mao Chinese writing, by which writers “aim at the heart of Maoism and begin to move toward it, but as they draw near are deflected in one direction or another.”3 Late 1970s “scar literature,” the labor-camp memoirs of Zhang Xianliang and Cong Weixi, and 1980s “avant-garde” writers like Yu Hua, Han Shaogong, Su Tong, and Can Xue can all be shown (despite all their other differences) to exhibit the pattern. Laughlin disagrees with me, at least for Mo Yan’s case, arguing that “Mo Yan’s intended readers know that the Great Leap Forward led to a catastrophic famine, and any artistic approach to historical trauma is inflected or refracted.” Laughlin sees Mo Yan as doing satire, not cover-up, and when the point is put this way, I can, in a narrow sense, accept it (even though my personal taste in satire does not extend as far as donkey dicks). The problem, in my view, turns on Laughlin’s phrase “intended readers.” Mo Yan has said in interviews that he does not write with any particular readers in mind, so “intended readers” here needs to be understood not as actual readers but as the kind of reader that is implied by the writer’s rhetoric. In this meaning, “implied reader” is a well-established term in literary studies, and it is fair enough to analyze things this way. My own worry is about the actual readers. How does “daft hilarity” affect them? I hope Laughlin will agree with me that Mo Yan’s actual readers are numerous, mostly young, and not very well schooled in Chinese history. To reach the level of what Laughlin sees as Mo Yan’s ideal “intended reader,” a young Chinese must leap a number of intellectual hurdles that Communist Party education has put in place: first, that there was no famine, because the story is only a slander invented by foreigners; second, that if there really was a famine, it was “three years of difficulty” caused by bad weather; third, that if the famine indeed was man-made, it still wasn’t Mao-made, because Mao was great; fourth, that if it was Mao-made, people died only of starvation, not beatings, burnings-alive (called “the human torch”), and brain-splatterings with shovels (called “opening the flower”), as Yang Jisheng’s book Tombstone documents. Laughlin writes that I expect “creative literature to approach historical tragedies in the form of a documentary exposé, with statistics, graphic images, and generous doses of authorial lamentation.” I think both he and I know that this is a straw man, and that my feelings are not hurt to see him impale it. Among writers who look honestly at cruelty, Alexander Solzhenitsyn and Xiao Hong are two of my favorites. Neither employs statistics, and both are about as far from “authorial lamentation” as one can get. Their spare prose is especially powerful precisely because it allows its enormous implications to be born and to grow inside the reader. Laughlin raises a related question about art under censorship: Isn’t it possible to live under political censorship and just ignore it—not obeying, not defying, not satirizing, but writing about the very large areas of life where the authorities don’t care and therefore you don’t have to distort anything and don’t have to worry? He cites examples of Zhou Zuoren, Liang Shiqiu [Liang Shih-chiu], and Zhang Ailing, who wrote essays and stories in the 1930s and 1940s that did not, except occasionally and tangentially, have anything to do with the Japanese invasion of China. The Japan issue dominated most other Chinese writers at the time, either because they lived under Japanese censorship or because, living in free China, the imperative of resistance was so strong. Laughlin asks a good question, and the three writers he names establish his point that political pressures (unless they are severe, as during the late Mao years) need not exterminate excellent writing. I salute Laughlin in particular for his courage in juxtaposing the two cases of Chinese writers under Japanese censorship between 1937 and 1945 and under communist censorship after 1949. It is a comparison that Chinese historians are loath to make and that Chinese publishers would find utterly untouchable. In general, the techniques of Japanese censorship were much more mechanical, and less psychological, than those of Communist censorship, but the fundamental dilemmas for writers were similar: Do I collaborate? How much? Criticize? How? What are the risks and rewards of my several options? Background differences notwithstanding, let’s join Laughlin in putting Mo Yan side-by-side with writers like Zhang Ailing, who wrote under Japanese censorship. Laughlin writes: “My point is not that Mo Yan is these writers’ equal.” Let’s hope not. Zhang Ailing’s glowing, finely wrought language is not just better, but far, far better than Mo Yan’s jumble of registers, and her deep psychological perception makes a cartoon of Mo Yan’s carnivalesque surfaces. But the point Laughlin wants to make is different. It is that Mo Yan “forcefully asserts his particular vision without regard to pressures to adopt and convey a political posture.” But this point is just plain wrong. It is abundantly clear that Mo Yan, beginning in the 1980s and continuing to today, is highly sensitive to political pressures and calibrates his postures accordingly. The main difference between him and the average inside-the-system Chinese writer is that he is cleverer in his calculations and has more layers. Both Laughlin and Mo Yan ask that we separate his political stances from his literary art, but this cannot be done. Mo Yan’s stances are inside his art as well as outside. His work shows political violence and corruption at local levels but (respecting what everyone knows are the wishes of Party Central) avoids conclusions about the system as a whole. And what about daft hilarity as an approach to the Great Leap famine? Even if we speak only of the “implied reader” and pure satire, can we imagine Zhang Ailing treating the Nanjing massacre as a big joke? She did not do this. Could she? The Chinese phrase xifangzhongxinzhuyi does not translate easily, so please pardon my awkward term “West-centrism.” I find West-centrism in Laughlin’s essay, but the problem is by no means his alone. It is widespread (albeit often unintended and unnoticed) in academe and in liberal political opinion in the West. When Anna Sun complains that she finds Mo Yan repetitive, predictable, and a jumble of disparate registers, Laughlin parries: “This is a strange argument to make about a twenty-first-century writer,” because “the world and its literature have departed from the kind of moral certainty of Dickens, precisely because of the crumbling of the moral foundations of the world of imperialism and the industrial revolution.” The world now has Woolf, Joyce, Pynchon, Rushdie, DeLillo, and others. Anna Sun apparently is lagging behind. What Laughlin calls “the world,” however, is not the world, but the West. Literary scholars in the West rail against “hegemonism” and “post-colonialism” but in fact practice these very things by establishing trends and then measuring the rest of the world by how well it imitates them. Is Mo Yan really part of a flow that began with Dickens and Hardy and has now come to Faulkner and García Márquez? Why should he be? Why is it not quite all right for his “hallucinatory realism” (as the Nobel committee called it) to be rooted in the storytelling tradition of his native Shandong, which itself includes flights of fancy like talking animals and aggrieved ghosts? In his Nobel lecture, Mo Yan paid tribute to the ghost stories of Pu Songling’s Qing dynasty collection, Strange Stories from a Chinese Studio. To me, his scenes of bloody fighting and machismo recall Shuihuzhuan, a fourteenth-century collage of stories about rollicking outlaws set in his native Shandong. His novels The Garlic Ballads and Frogs show a moral certainty just as confident as Dickens’; do we want to say that his flights of imagination in other works show how he has catapulted himself through the experience of the West all the way to post-modernism? What if his “disparate registers” are not a “twenty-first-century response” to the “crumbling of moral foundations after imperialism and the industrial revolution”? Why do we put him in a Western bag? After the “opening” of China in the 1980s, cultural elites promoted the watchword “walking toward the world.” Writers liked to claim influences from this or that famous foreign writer, even if they had read little or nothing of the foreign writer’s work. Mo Yan illustrates the point in his Nobel lecture when he says he “was greatly inspired” by Faulkner and García Márquez, but in the next sentence says “I had not read either of them extensively.” Westerners as well as Chinese have enjoyed and perpetuated this West-centrism. How flattering that gifted writers from that mysterious socialist country on the other side of the world see us as the literary mainstream and forefront! Westerners’ use of the word “socialist” for China sometimes illustrates the same kind of condescension. The regime does, of course, call itself socialist. But everyone who lives inside the society knows that it runs on wild money-making, has huge income inequality, is very low in public trust, has social safety-nets that are tattered or non-existent, and manipulates words like “socialism” only when public performance, which is done for the sake of political safety, demands it. Chinese society is nearly at an opposite pole from socialism in a country like Sweden, and yet Laughlin (again I don’t mean to pick on him personally; the practice is widespread) several times uses the word “socialist” to refer to today’s China. I worry not only about the factual inaccuracy of the usage but about the subtle condescension in which it is embedded: You people on the other side of the wide ocean have what we Western liberals call “socialism.” Nice. The late astrophysicist and human rights activist, Fang Lizhi, was good at pointing out double standards in Western attitudes. When Communist dictatorships fell in Europe, the Cold War was declared “over.” But what about China, North Korea, and Vietnam? If the reverse had happened—if dictatorships had fallen in Asia but persisted in Europe—would Washington and London still have hailed the end of the Cold War? What if Solzhenitsyn, instead of exposing the gulag, had cracked jokes about it? Would we have credited him with “art” on grounds that his intended audience knows all about the gulag and appreciates the black humor? Or might it be, sadly, that only non-whites can win Nobel Prizes in this mode? Pankaj Mishra, in a recent essay in The Guardian called “Why Salman Rushdie Should Pause before Condemning Mo Yan on Censorship,” acknowledges that Mo Yan has offered deplorable support to China’s rulers. But the main point of Mishra’s essay is that Western writers have also been the handmaidens of power that oppresses people in distant places. He asks, therefore, that people like Rushdie (and me, whom he also mentions) “pause.” As a young man I protested the U.S. war in Vietnam; I have never been a handmaiden to U.S. power and I admire some of Mishra’s penetrating observations, for example that “Jane Austen's elegantly self-enclosed world” depended on unseen “hellish slavery plantations” in the Caribbean. But why does any of this mean that I should “pause” before criticizing Beijing or its acolytes? A: Country X has problem P.
B: On the contrary, country Y also has problem P.
In most conversations, people overlook B’s logical absurdity because the real point is the advice that B is giving to A. If A is a citizen of country Y, he or she should shut up about country X. But why, especially in our increasingly globalized world, should this be? Must Salman Rushdie hold his tongue about Beijing until London is squeaky clean? My guess is that Pankaj Mishra, if you could shake him by the shoulders, would say (as I would) that any citizen of any country should be free to criticize any government anywhere that oppresses anyone. But his article does not leave that impression. Authoritarians in China and elsewhere regularly take the position that foreigners should keep criticisms to themselves, and the reasons for their position are obvious. The reasons why Western liberals often take the same position are far less obvious but well worth probing. When I give public lectures on human rights in China, I very often get questions from audiences that ask, one way or another, “Why are you criticizing the Chinese government when our own government is so bad?” I believe that, despite its surface appearances, this kind of view depends on West-centric condescension of the kind I discussed above. Let me explain. In cases where a problem is found everywhere in the world, it hardly follows that it is the same size everywhere. The kinds of problems that Mo Yan and Liu Xiaobo present—suppression of speech to protect state power, harassment and prison for “offenders”—can be found in democratic societies, but to stand on that discovery and say “look, the whole world is the same, so let’s calm down” is not only intellectually feeble but, when uttered by people who live at comfortable distances from the true suffering, is morally indefensible. How do you think a Chinese liberal, sitting on a bench in a drab prison, would feel to hear an American liberal, sitting on a couch with the Guardian, say, “You and I both live with aggressive governments, my friend; I must pause before criticizing yours”? Actually we don’t need to guess at the answer. Former political prisoners from many places—China, Czechoslovakia, South Africa, Myanmar, and elsewhere—have made it abundantly clear that during stays in prison they craved any support they might get from the outside world. I find the condescending attitude especially distasteful because its main purpose is to comfort the condescender. In American liberal culture people feel good when they express criticism of their own society. It shows “critical thinking,” “independence,” and a generous broad-mindedness, all of which one can congratulate oneself for having. (True independence, in fact, is rare; the “critical” views one hears often show great conformity, and one major source of the comfort I am referring to is the confidence that one’s conforming expressions will be safe from attack by peers.) Comfort is a good thing; I am not opposed to it. But to make the mental comfort of someone in an armchair a higher priority than the spiritual and physical torment of a prisoner is disgusting. When people [like me] who engage in high-profile confrontation with the regime hear about people who are [staying inside the system], perhaps pursuing matters in more low-key ways, the high-profile people should view the efforts of the low-key people not as errors but as contributions that are complementary to their own. … The decision by one person to pay a heavy price for the ideals he or she has chosen to pursue is insufficient grounds to demand that any other person make a similar sacrifice. Where Liu would disagree with Laughlin is on whether Mo Yan in particular is one of those people pushing for human rights and democracy inside the system. Some things Mo Yan does and writes look like pushes, yes; others, far too obvious, look like acquiescence to the counter-pushes of the regime. I am certain that Liu Xiaobo would find Mo Yan unnecessarily weak. Does Mo Yan Deserve the Prize? Charles Laughlin notes that I have published an essay called “Does This Writer Deserve the Prize?” but do not answer the question. Fair enough. The title of my essay was written by editors of The New York Review of Books, and I did not see it until the piece came out. Let me address the question now. Ways to measure excellence in the natural sciences are objective enough that the question “Did X really deserve a Nobel?” can be answered with some confidence (if never certainty). For the literature and peace prizes, though, the question is so beholden to personal impressions that consensus is impossible. Henry Kissinger won a peace prize. If that happened, what is not possible? The answer is no, Mo Yan would not have been at the top of my list. For authenticity and control of language, I would rate Zhong Acheng, Jia Pingwa, Wang Anyi, Liao Yiwu, and Wang Shuo more highly; for mastery of the craft of fiction, Pai Hsien-yung and Ha Jin are clearly superior to Mo Yan; for breadth of spiritual vision, Zheng Yi is one of my favorites. I would also have put Yu Hua or Jin Yong (the Hong Kong writer of popular historical martial-arts fiction) above Mo Yan. But those are only my views. Please help yourself to your own.